Family and heritage is haunting. No matter who we are and where we ae going, those who have populated the past will always help guide us and are staunch reminders of the strength and glory we have nestled inside us. Even those who are taken from us too soon. Garrick Hamm, acclaimed director of short films such as Retrospective and The Man Who Married Himself takes an intimate look at one young boy’s journey to discover more about his father. Based on the tragic true story of John White, a Tottenham Spurs footballer who was killed after being hit by lightening, The Ghost follows ripple affect his death has on his young son Rob, who never had a chance to know his father. The short is an emotional journey and exploration into how grief can affect continue to affect, even if that sorrow isn’t direct. As Rob tries to understand who his father is, the impact of his death still sends painful waves through him and his mother. Hamm delicately weaves innocence into the heart of the story as Rob earnestly longs for communication from his dad or tackles a loal bully. Whether it’s utilising Rob’s action figure to convey emotion or an epic singalong with some classic tunes, there’s a great sense of childhood here, adding a layer of realism, joy, and embellishing that youthful sadness. The 70s look of the film adds a brilliant aesthetic and fleshes out this truly profound story. Emilia Fox continues to be an engaging and gifted actress, embodying the heart-break of not only losing her love to soon, but having to raise their children without him. Blighted by moments of misery and yet having strength to open herself up to her son, Fox is compeling as a mother trying to cope and be the best parent for her children. However, it’s the young Felix Jamieson who steals the show here. As the quiet and introverted Rob, he comes into his own as he explores who his father was and why he was taken away from him. Jamieson presents a believable performance as this boy just trying gage how much of his father he carries with him, shifting through the emotion in an endearing youthful performance, layered by the grief of loss but also unknowing and understanding. The Ghost is a poignant story about our family connection and who builds us when we are young, even those who were taken from us before we had a chance to know them. Not only this, but it is a intricate and emotional tribute to the White family – the memory of John and the legacy that Rob has continued. Find out how you can watch The Ghost! Pin Cushion – Brand New Trailer! For some, we’ll be bullied for our. It’s a senseless and traumatic experience and there are not many films that explore it on the big screen but Pin Cushion looks to be an experimental exploration into it. Pin Cushion revolves around a young girl who moves into a new town only to become victim to taunting and bulling. To cope, she enters a fantastical world to escape. It looks as though there are some great performances here and there has been a lot of talk following film festivals. What do you think? Zoe – Brand New Trailer! Endearing romantic dramas that brood with a different element are often phenomenal and Zoe looks just that. A mixture of many different stories such as Eternal Sunshine of the Spotless Mind and Her, this looks enticing, especially as it stars Lea Seydoux and Ewan McGregor. What do you think? Zoe is out later this year! Hearts Beat Loud – Trailer! We definitely need more feel good movies in our lives. Films of love, compassion, excitement, and creativity. We need all of that and more. Which is why we’re excitedfor Hearts Beat Loud. Starring Nick Offerman and Kiersey Clemons, Hearts Beat Loud revolves around a father and daughter who, after the fall of their vinyl shop, decide to start a band together. With support from Toni Collette and Ted Danson, and an amazing enegery already coming from the trailer, this film looks incredible. What do you think? Hearts Beat Loud is out 3rd August. On 23 June 2018, the second anniversary of the British vote to leave the European Union, tens of thousands of people took to the streets of London to demand a second referendum to decide whether the public should accept the final deal. 400 miles away, the Edinburgh International Film Festival hosted the world premiere of David Wilkinson’s ‘talking heads’ documentary Postcards from the 48% in which the director tours the country to canvas the opinion of ‘remainers’, some of the 16,141,241 who voted for the United Kingdom to remain in the European Union. He visits Miriam Margoyles, whose house is the closest in the UK to France. He takes us to The Convention, a two day conference on ‘broken politics’ held in London prior to the June 2017 snap election in which speakers included the novelist Ian McEwan and economist Will Hutton. You’d think from the film that the Convention was about Brexit rather than a failure to grow political engagement. When Wilkinson interviews historian A C Grayling and ‘New European’ editor Matt Kelly, the arguments are erudite and succinct. Yes, the referendum was advisory and the decision to trigger Article 50 unnecessary. Yes, the impact on UK business will be severe. However, Wilkinson’s range of interviewees doesn’t reflect his audience. Too many people on screen are white, middle-aged or older and middle class. By not showing the other side, he is effectively refusing to engage with working families and socially marginalised, the very groups who need to be persuaded that the decision to leave the European Union is not in the UK’s best long-term interests. Wilkinson’s tour includes Wales, Scotland and Northern Ireland. He visits Lush Cosmetics, which sells products made in the UK by European Union workers to Europe. Political documentaries need human stories to persuade audiences that the status quo – remaining subject to the European Court of Justice and enjoying the freedom of movement, goods and capital – is preferable to the alternative. However, Wilkinson uses the tired technique of interviewing celebrities and experts, who lack the authenticity to influence the opinion of his audience. Running at almost two hours, Postcards from the 48% is a cry from the heart of sorts, but aligns the Remain argument with politically toxic figures and outright eccentricity. I almost applauded when Wilkinson interviewed some young people, two members of OFOC – ‘Our Future Our Choice’ – though the pressure group speaks mainly to the student group and has, to date, only 6,700 Facebook likes compared with the anti-EU UK Independence Party’s 580,824. Wilkinson reminds us that the UK has strong ties with other European countries, taking us to the Polish War Memorial and reflecting on the part Polish pilots paid in the Battle of Britain in World War Two. This is the closest he gets to an emotional appeal, arguing that the UK is at its best when it works within a wide coalition of the righteous. 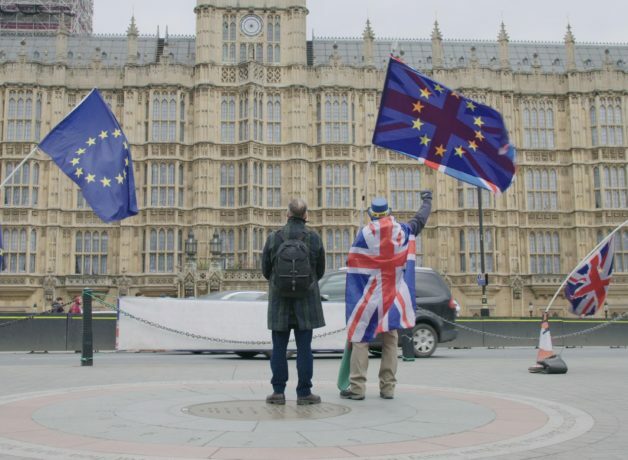 Can a documentary make a difference, allowing the UK electorate to accept that its decision to leave the European Union is wrong? Maybe not this documentary, but there are other stories to be told. Mandy – Brand New Trailer! Every so often, there is a film that comes into your life that you have to watch. It entices you, making you yearn for more, making you salivate over the feature, making you yearn for every single piece of marketing…. …Never would I thought I’d be saying that about a Nicolas Cage film but here we are. Mandy revolves around a couple living an idyllc lifestyle until a bike gang destroys it all. Now Red fights back in a phantasmagoric journey of blood -filled vengence and fire. There is something so brutally beautiful about this thriller. We’re excited to see Cage and Andrea Riseborough in action. What do you think?